To know what you are getting into. Does the company have a lot of debt and a heavy interest load to carry? For that matter, is the company in bankruptcy or in a debt workout situation? Has the company had a consistent earnings record over the past 5 to 10 years, or has its profit ridden a roller coaster over this time? Has the company issued more than one class of stock? Which stock are you buying, relative to any other classes? You would obviously inspect a house before getting serious about buying it, to see if it has two stories, three or more bedrooms, a basement, a good general appearance, and so on. Likewise, you should know the "financial architecture" of a business before putting your capital in its securities. Financial statements serve this getting-acquainted purpose very well. One basic stock investment strategy is to search through financial reports, or financial statement data stored in computer databases, to find corporations that meet certain criteria—for example, whose market values are less than their book values, whose cash and cash equivalent per share are more than a certain percent of their current market value, and so on. Whether these stocks end up beating the market is another matter. In any case, financial statements can be culled through to find whatever types of corporations you are looking for. 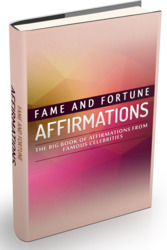 The big book of affirmations from famous celebrities. Affirmations and positive thinking work by drawing in energy and focusing it with the subconscious to bring about change.